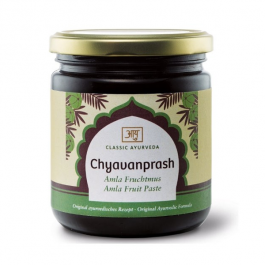 Manufactured according to original recipe from the classical Ayurvedic texts, our Chyavanprash contains only fully ripe Amalaki fruit, the precious bamboo product Vanshlochan and a large number of high quality natural herbs, fruits, roots and spices, all very carefully harvested in the best and most authentic Himalayan regions and other parts of India. One of the main ingredients of this marvelous and ancient recipe is Amalaki. The fruit of the Amalaki tree contains high levels of Vitamin C and balances all three doshas. It includes five flavours (all except salty). In the classical Ayurvedic texts Amalaki is one of the most highly valued and important Rasayanas (life-elixirs) boasted by Ayurveda, with a rare combination of positive properties. In the authentic Ayurvedic writings Amalaki is even described as a ‘divine healing plant’. 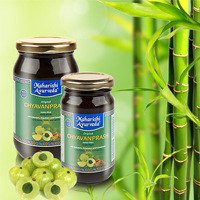 The bamboo product ‘Vanshlochan’ is also mentioned in Ayurveda as a valuable tonic. It is produced in a very complex process from a special bamboo variety. 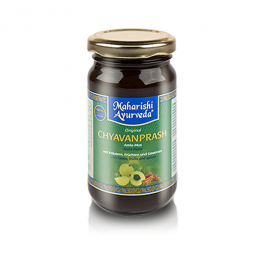 Nowadays Vanshlochan has become so rare and precious that because of the high price many manufacturers unfortunately use cheap and synthetic variants in the production of Chyavanprash. 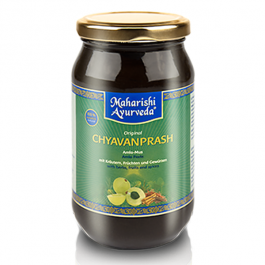 We at Maharishi AyurVeda stand for nearly 30 years for authenticity and originality. From the beginning, we have committed ourselves to keep the knowledge of Ayurveda in its purity, and offer only the highest quality to our customers. We ensure this by never compromising in the manufacture of our products. 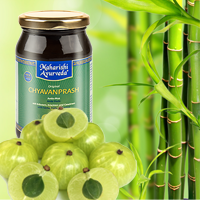 Therefore, it is obvious for us that Maharishi AyurVeda Chyavanprash is produced exclusively with natural Vanshlochan. 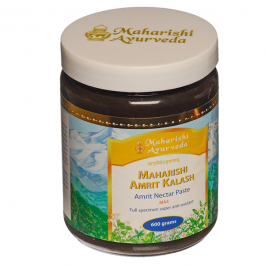 You may also like to order Maharishi Amrit Kalash - Nectar Paste and Ambrosia tablets. One of the main ingredients of this marvellous and ancient recipe is Amalaki. The fruit of the Amalaki tree contains high levels of Vitamin C and balances all three doshas. It includes five flavours (all except salty). In the classical Ayurvedic texts Amalaki is one of the most highly valued and important Rasayanas (life-elixirs) boasted by Ayurveda, with a rare combination of positive properties. In the authentic Ayurvedic writings Amalaki is even described as a ‘divine healing plant’. 450g in a glass jar.